Tasmania Premier LaraGiddings emphasised the benefits V8 Supercars bring to the state, today sayingshe certainly sees a long future for the sport in Tasmania. Currently runningunder a multi-year deal from 2012 to 2014, Premier Giddings said negotiationsfor the next period haven’t begun. “We’ve had V8shere since 2004 and Tasmanians strongly support the series,” she said. “It’s a fantastic series which we get a hugeeconomic return for, so while we haven’t started negotiations, we certainlywould see a future for V8s in Tasmania. “We get roughly 60,000 spectators over theweekend, which is one of the biggest sporting events our state has each andevery year. Premier Giddings believes it’s important tocommunicate the benefits of the series. “We put in roughly $600,000 of government moneyinto each event and we get about $2-3 million return to the economy. People arebeing paid salaries through catering, transport options, accommodation and actualbenefits of the people –the crews, those who support drivers as well as the spectatorswho travel interstate to come to Tasmania. Jobs are not only created for the period of theevent – the more Symmons Plains Raceway is used, the more long term jobs andinfrastructure. Premier Giddings said she never thought she’d bea “petrol head” but was obviously impressed by the spectacle of the Supercars. “You can’t help but be enthralled by everythingyou see. The Premier was happy to see Microsoft onboardas a naming rights sponsor of the event, as the NBN (National BroadbandNetwork) is rolling out. “That’s critical infrastructure and organisations likeMicrosoft make that NBN work for people in their own homes, so it’s good to seeMicrosoft’s interest in Tasmania and Supercars. 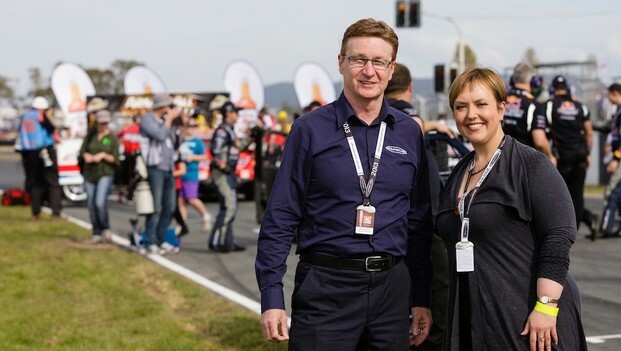 While she may be converted to a petrol head –Premier Giddings isn’t keen to step in for a hot lap, “No way!”.